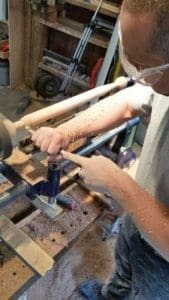 I love watching my Carpenter and other craftsmen work. If you contemplate the time it takes to build that skill… If you let it seep into your soul how much real time it takes to create an object, it can build in you a deep appreciation for what a craftsman does. In a world that is full of convenience and factory/machine made products, we forget the deeper beauty of a handcrafted item. We forget the love and labor ingrained into its design. Whether it be a quilt, a can of jam or a rolling pin, the care put into a handmade item brings a warmth and joy that simply can not be instilled into a product that is made in a factory with a million others just like it. Wood especially is an interesting medium. It seems so rigid and hard yet it is alive. Wood changes with climate, it can soak in moisture, it can move as it simply sits… trees may look so similar when you stare at a forest full of them but every tree and therefor every piece of wood is unique and beautiful. When we start working with a piece of wood we always hope for a specific outcome but what we get in the end sometimes fits that hope, sometimes exceeds it and well… sometimes it ends up in the “fancy firewood” pile. 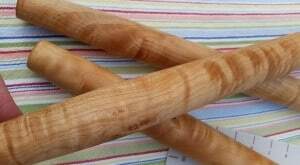 Why a French Style Rolling Pin? 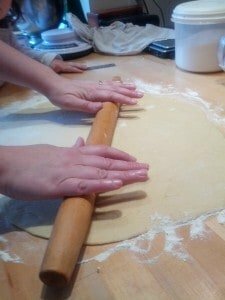 A few years ago I was watching a cooking show (I have no idea which one) and they talked about the benefits of a french style rolling pin. I had an American style (handles on ends with ball bearings that allow the middle to roll). I was not happy with it. I couldn’t feel the thickness of the dough or pastry without lifting up the pin and feeling the dough. I have also had issues with my wrists and hands and gripping the handles was not comfortable. So, when I heard about the French Style Pin I wanted to try one. Being that I don’t like to spend money on myself….well, I never got one. When we started Lady and the Carpenter a French Style Rolling Pin was put on the top of the list of items I wanted us to make (for obvious reasons). 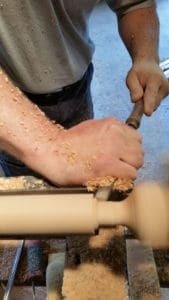 Soon after the final prototype was complete, a friend of mine was over for a visit and loved my new rolling pin but wanted a smaller version. She lives in a small space with tiny counter tops and a 20″ pin was simply too long. So, we made her a 14″ pin and gave it to her to test out. 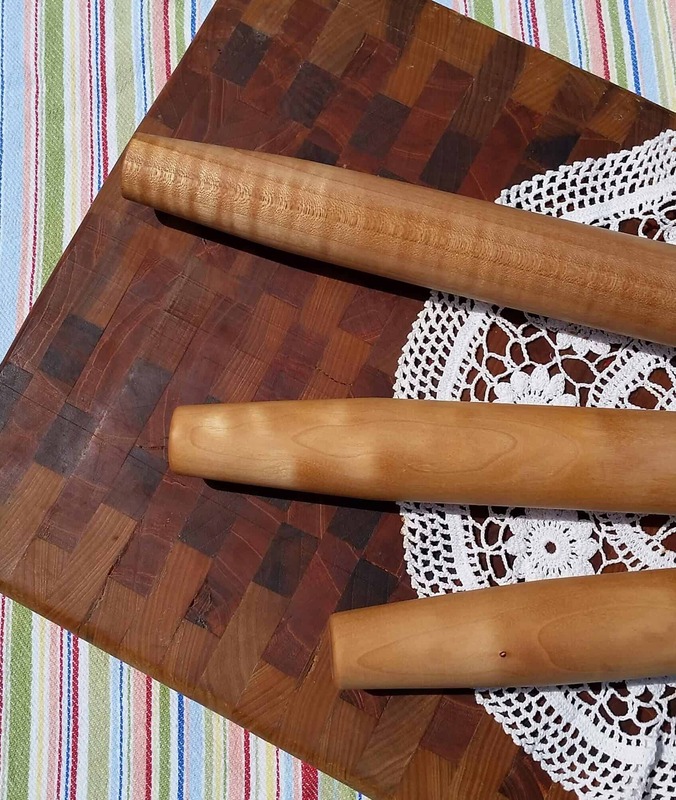 She loved the rolling pin…so the 14″ rolling pin was created. 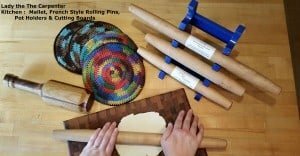 I made an instructional video for you of the process of making a rolling pin. I include instructions throughout. It is simply easier to explain this kind of process in a video. We do not give specific measurements throughout because this is intended to be a basic outline for making a french style rolling pin. However, the final dimensions for the rolling pin created was 20″long with a middle diameter of 1.5 inches and end diameters of 1 in.. There is a 4 inch taper on each end. When making your own customize yours to fit your tastes. Hope you enjoyed the tutorial and the behind the scenes look of how to make a French Style Rolling Pin. Thanks for the tutorial! My DH is making one for our daughter and we lost the measurements. The finish is beautiful! I know. People say pie crust is really easy, but I beg to differ. Maybe I just haven’t made pie crust enough. I do make a killer quiche crust (if I do say so myself), but it wo7dln&#821u;t work for pie. How did you use the squash for breakfast? Anything special? I can’t wait to make another pie. I need an occasion first….